Deep-fried morsels of sugary goodness and a cup of coffee for many is the perfect way to start the morning, or the ideal sweet snack during the day. 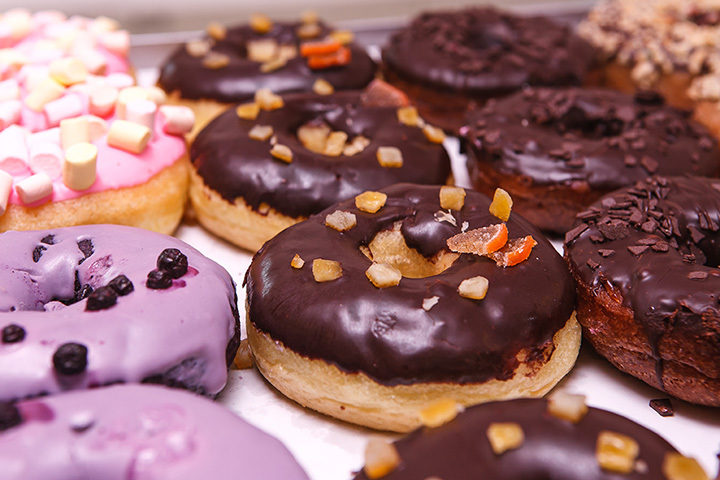 Whenever you’re craving one of these decadent treats, New Mexico’s delicious doughnut shops can help you out. Here are 10 of the best. Dr. Seuss wrote about Whoville, a colorful, magical, whimsical place full of warm-hearted people. Whoo’s Donuts would fit right in. The doughnuts are brightly colored, covered with fanciful toppings like maple glazed bacon, chile brown sugar, toffee chunks, swirls of white chocolate, lavender glaze and filled with dreamy creams like Key lime, summer peach, mango habañero and lemon ganache. Local favorite is the blue corn blueberry lavender. Doughnuts are made fresh daily with locally-sourced and organic ingredients. Get there early—they sell out! The bakers behind this innovative doughnut shop are resisting convention and creating unique artisan doughnuts with an attitude. Named “Best of Albuquerque” many years running, you’ll find both cake and yeast doughnuts in all sorts of tastes and flavors. In a tribute to the television show “Breaking Bad,” try the Blue Sky doughnut topped with bright blue sugar crystals. The French Toast doughnut captures the essence of that favorite breakfast. The blue corn honey piñon is a taste of New Mexico. Also on the menu are kolaches, a filled puffy pastry, and the jalapeño sausage cheese are amazing. Vegan and gluten free options available. Not only is this bakery the winner of the last year’s Reader’s Choice Award from the Las Cruces News, it’s a winner in the community, donating all end-of-day breads, pastries, pies, cakes and cookies to the El Caldito Soup Kitchen. You’ll find classic choices here: Powdered, glazed, sprinkled, buttermilk, French crullers and long johns. Daily specials highlight unique flavors like apple cinnamon crisp cake. Both yeast and cake doughnuts are made fresh daily. This popular bakery and eatery is a local hangout which generally means the fare is worth-stopping for. The doughnuts at Glenn’s are no exception. Both cake and yeast are made fresh daily and are simply delicious. Glazed salad-plate sized cinnamon rolls, apple fritters, twists drizzled with both white and dark chocolate glaze and maple-glazed long johns are standouts at this old-school coffee and doughnut spot. In business since 1980, owners have mastered the art of making doughnuts. Drive-thru if you just can’t wait. Inside seating, too. There’s nothing more comforting than walking into a donut shop and seeing cases filled with rows and rows of traditional-looking doughnuts. That’s what you’ll find at Sarina’s, a family-owned and operated eatery that makes everything fresh daily. There’s a mix of both yeast and cake in classic flavors and toppings. The old-fashion glaze is one of their best—a mix of crunchy, soft and sweet. Try the rocky road or the maple with bacon for something a little more exotic. Start your day early at the drive-thru which opens at 4:30 a.m. The small amount of indoor seating is cozy and the aromas are wonderful. This is a full-on bakery—pies, cakes, pastries, breads—but if you get there first thing in the morning you’ll get the best of their doughnuts. Fresh out of the ovens, the cake ones are soft and moist, and the yeast sticky with a little crunch. Try the French beignets for an amazing deep-fried doughy goodness covered in powdered sugar. A great place to sit on their porch and enjoy the fresh mountain air, a cup of coffee and a chocolate covered donut … or a cinnamon roll … or a apple fritter … or all three. If you’ve never had a spudnut, which is quite likely, then this is quite a treat. It’s a hand mixed doughnut made with potato flour which gives it a light and fluffy texture. The recipe used here has been passed down through three generations of spudnut makers. The “spuddy’s” come in traditional flavors as well as not so traditional like hot cocoa, rocky road, almond joy, chocolate cherry cheesecake and even Irish cream. Bite-sized donut holes too and a little afternoon delight: Spudnut a la mode! This small town is an oil town so it’s appropriate that there’s a doughnut shop that showcases that industry in its name. The doughnuts are fresh made daily and are sticky, yummy finger-lickin’ good heavenly halos. Nothing too fancy, just simple and delicious traditional yeast and cake varieties, plus cinnamon rolls, apple fritters and kolaches. If it’s early morning and you’re headed east out of New Mexico, grab a dozen for the road. They might just make it to the border! When you want to start the day right, start it here! Choose from a selection of raised and cake doughnuts, cinnamon rolls, long johns, glazed and fancies like the coconut, caramel, spice blueberry. Doughnuts are, of course, made fresh daily, as is the coffee. Make your selection at the counter and then sit-down or take out. Worth watching the sun come up with a Daylight doughnut. These are the doughnuts you should take to your next office meeting or kid’s school party or church potluck. You’ll be beloved. In this unassuming shack on the side of the road is a baker. No frills, honest-to-goodness doughnuts fill the cases. Some are sugar encrusted, some filled with gooey cream, all are delicious. Local favorite is the cream-filled long john. They’re quick to sell out, so get there early.